I bought two of these sweet little ceramic urn vases at a local thrift store on 50% off day so I paid just $2.50 each. One had an "as is" sticker, but it was just because of a small stain. I just turn the stained area to the wall. I mean for $2.50 who cares about a little stain? Then the dilemma began as to what to put in the little urns (that I had determined would go on the mantle). I don't have a cutting garden and I can't afford to buy fresh flowers weekly to keep them filled, but I really wanted something "green" but not an artificial plant. I finally decided on decorative moss balls. Since I needed a very specific size to fit perfectly into each vase opening, I decided to make my own. I picked up two foam balls and a sheet of the instant green moss at JoAnn's which ended up being super cheap because I had those handy 50% off coupons. I got out my trusty glue gun and got down to it. And many minor and one major (ugly, blistering) burns later, my moss balls were done and looking lovely in their little vases. I'm still awaiting the arrival of these candlesticks I ordered from Restoration Hardware that will eventually flank either end of the mantel. However, I just received yet another notice from Resto that they are delayed until "early November" so who knows? It may look like this until the Christmas decorations go up in a few weeks. I've said it before and, sadly, I must say it again, I'm a bad blogger. I can't believe it's been a month since I last posted. I actually tried to post a few times but was unsuccessful. I won't bore you with too much detail but I took my macbook to the "genius bar" at the local Apple store to have it upgraded and he accidentally wiped out my hard drive. Yeah....it hurt. Still hurts to remember it. After the Apple expert (stuck to the experts on their phone help line this time) patiently worked with me over several days, we restored much of the drive but some things just don't work the same way. I tried a few times to post and just as I was finishing up the post, it would abruptly "blow up". Nothing. Everything wiped out. My choices were to throw the laptop at the wall, cry or shut the lid and walk away. I chose walking away cause I really need the laptop and crying....well, it isn't much fun is it? So a month later, here I am. I've been crazy busy and my business is really picking up (yay!!). Still, I've been finding time for lots of little projects that I plan to share. We left off with my foyer that I wanted to makeover. After having had my garage sale, I had a pretty good grip on what I had stashed away. So I decided on a wall of retro images .... mostly black and white with just a couple in color and I actually found ones I like within the same color group. I also had a nice supply of black frames and white mats. This black and white exhibition poster I bought at an artists studio in Cleveland's Little Italy on one of the art walks I attended about 13 years ago. They had a ton of old advertisements and posters in cheap plastic frames for about $1 each. I was looking for cheap art for my guest room and this fit the bill. The sketch of Jackie Kennedy I cut from an old coffee table book on the 60s and the sketch of Grace Kelly I downloaded from the web. Both were chosen because I love their style. Jackie for obvious reasons. Grace because she was such a mystery and truly a classic movie star. No one has mystery today in the age of TMZ. This Derry & Tom's poster was purchased at the same art gallery as the exhibition poster, also in the same cheap plastic frame I bought it in. Derry & Tom's is an old London department store that no longer exists. I love that the oranges, tans and black echo the vintage post cards in the top frame. For my initials I just went to JoAnn Etc. and purchased those cheap wood letters and spray painted them white. This is my first and middle initial. I attempted to put my last name initial as well, but it chose to plunge to its death and shatter after I hung it. I did buy another one, but when that one also attempted to plunge to its death (I managed to catch it in time), I decided it was best to just leave it at these two. Who needs a last name? Lastly, I cut this photo of a 60s art installation from the same book I cut Jackie's sketch. On the other side, I simply swapped out the large gold mirror for this more contemporary mirror with coat hooks mounted on the sides. It was hard to get a good picture of it without getting major flash. So that's my use what you have makeover of my tiny foyer. Happily only one letter was harmed in the making of this foyer wall. After a rather painful episode involving the "genius bar" at my local Apple store, I finally have my macbook up and running and almost restored to its original magnificence. Some things are lost forever, but that's life right? Always hand over your laptop with great apprehension and never do so without backing up your hard drive before hand. Lesson learned. The other side had a larger gold mirror (all of the mirrors sold in the garage sale - yay) that I forgot to photograph. Rather unremarkable but it served its purpose. Keep in mind it's actually upside down because that happened to be the way I pulled it out of the car and it was rather heavy so I elected not to mess with righting it until I'm ready to hang it (either tonight or tomorrow). Best part are these hooks (again, photographed upside down because I'm too lazy to go into iphoto and flip the picture)...4 in all...that you can hang your keys or a hoodie on to grab on your way out the door. For the opposite wall, I'm going to cover it in black framed posters, photos, etc that I had around the house. I only had to purchase a couple small black frames from JoAnn's (using my 40% off coupons) for the few things that didn't already have frames. I can't wait to show it to you :). Bedrooms have been on my mind lately. Specifically, I love how virtually any color comes alive when it has some crisp white to contrast with...white wood trim, white bedding, white accessories. There's nothing like crisp, clean white bedding to make you want to crawl into bed and dream a little dream. Here are some real life (i.e. 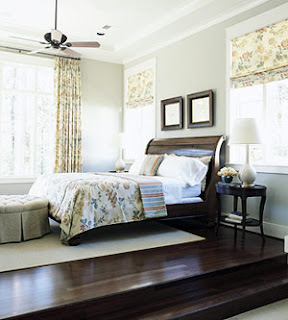 people like us) bedrooms from BHG readers. I love the way the soft yellows and gray play off the crisp white (not to mention the dark wood raised ceiling). The ghost chair is the perfect touch. Love the traditional navy and white with dark wood furniture. Chocolate walls and white bedding...soooo perfect. The picture below I included for just one reason...check out the floor. No, not the beautiful glossy dark finish...check out the stairs leading up to the glossy wood floors. The bed was placed on a platform within the bedroom. I don't know about you, but I wouldn't make it through one night in this bed. One trip to the potty at 2 AM and it's all over...SPLAT. Hurts just thinking about it. What are your favorite colors for a bedroom? p.s. Stay safe out there. No platforms in the bedroom please.